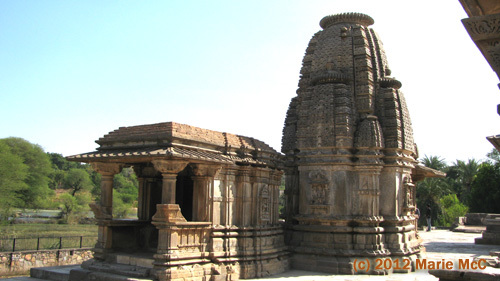 Unlike the Eklingi Temple, the Sas Bahu Temples near the town of Nagda are not in current use except by sight seers. And there are not many of those. “Saas” means mother-in-law and “bahu” means daughter-in-law. 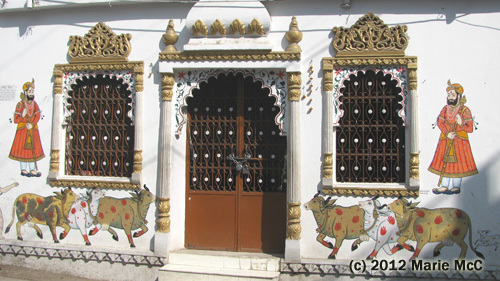 There are two main temples and one smaller one. The one on the right is missing most of its cone-shaped roof. 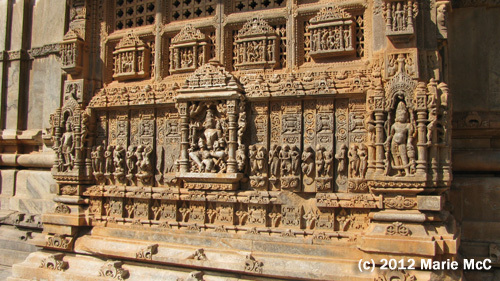 These are Hindu temples dedicated to Lord Vishnu. 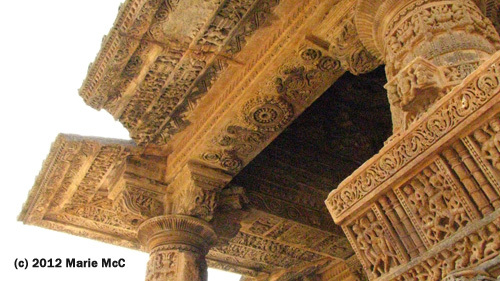 They are said to have been built in the 10th century. 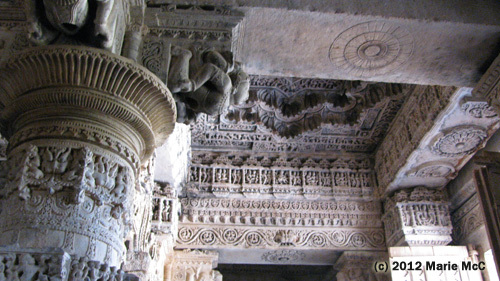 The temples are carved with much detail, both inside and out. Unfortunately, time and vandalism have taken a toll. But there was still much to see that was interesting. 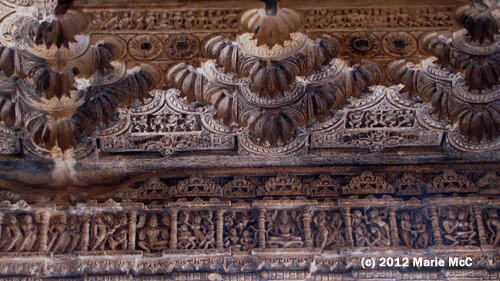 The interiors were a festival of detail. The small temple is at the rear of the two larger ones, by the side of the lake. 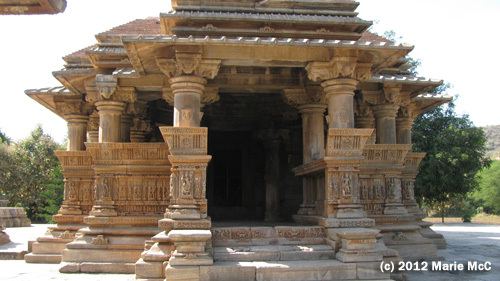 I much preferred the quiet, serene atmosphere of these unused temples to the busy-ness of the Eklingi temple. Here I was not a distraction to those who came to worship. Pinu and Pushker patiently waiting while I snapped a zillion photos of the temples. The online Frommer’s Guide recommends skipping this temple “unless you’re of the archaeological bent” and promoting instead the zoolike atmosphere of Eklingi. My recommendation is exactly the opposite. I hope the foregoing photos illustrate the foolishness of following guidebook recommendations without doing a fair amount of research before making up your mind. While I check out a lot of material online to get ideas of what to visit, I rely more on images rather than a misguided guidebook opinion on what I should see. 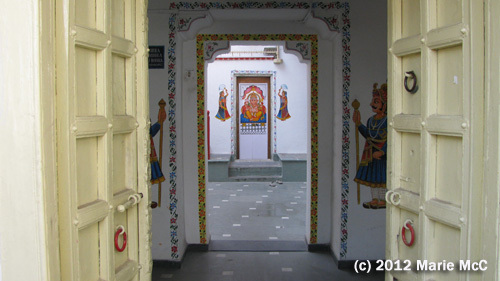 I spent several hours at Sas Bahu, took hundreds of photos there and enjoyed every solitary minute of it. I’ve also spent time at crowded places — the Taj Mahal being the prime example — and enjoyed it because I knew the background and had wanted to go there for a long time. It’s the architecture I enjoy, not so much the crowds. 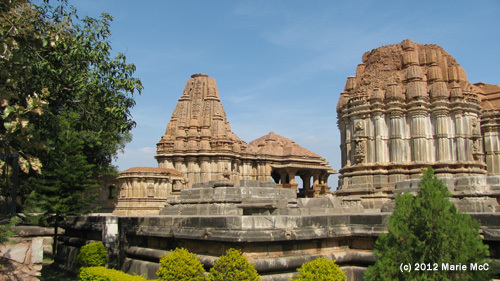 The Sas Bahu temples are far from the town center and somewhat isolated. If you decide to go, it’s best to hire a taxi to take you there and wait while you explore, as it’s quite a hike even to the nearest bus stop. 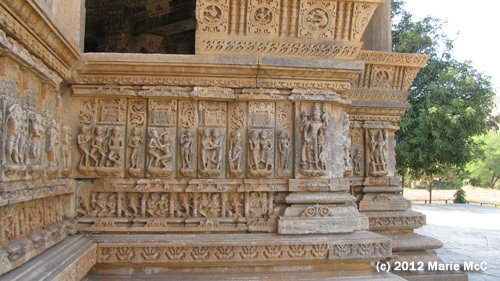 On my list of things to see was the Eklingi Temples, a group of over 100 temples in Eklingi village, about 20 km from Udaipur. Pushker was more than happy to take me there. He called Pinu, another tuk tuk driver friend, to provide transportation. At the outskirts of the city, I saw a bright spot of color ahead and had a chance for just one shot as we puttered past. Pushker said the camel was probably going to a wedding. 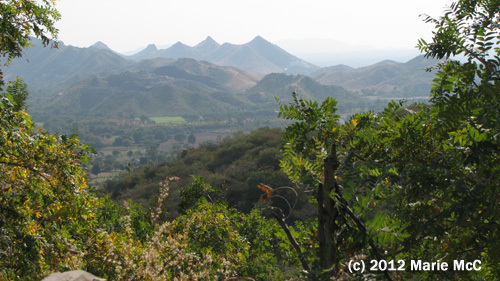 The ride through the Aravalli hills was pleasant and took maybe a half hour. These were not steep mountain roads with sheer cliffs like in Himachal Pradesh, so even though we were in a tuk tuk with no seat belts, the ride was fun rather than terrifying. I knew there was no photography allowed at the main temple, which is still being used for worship, but I thought I might be allowed exterior pictures at one of the many others. As it turned out, the rest of them were roped off, and visitors were not allowed to wander around them. As long as you were outside the gate, you could take pictures. As soon as you stepped beyond the gate, you had to put your camera in a locker along with your shoes. This is where a zoom lens comes in handy. 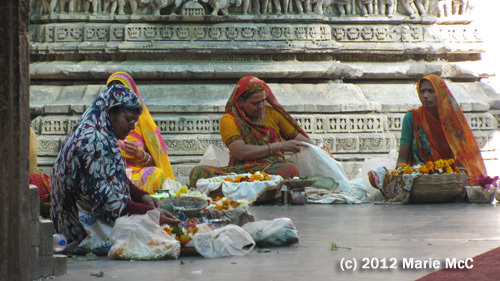 We bought some flowers for offerings at the ceremony inside. 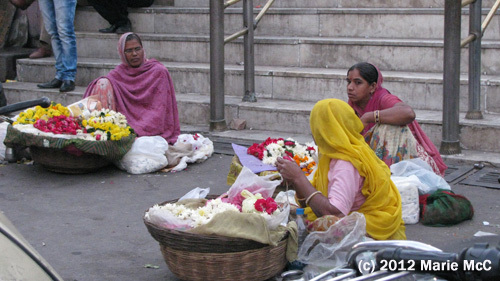 The flower lady examined my 20 rupee note carefully and declined to accept it because it was torn. 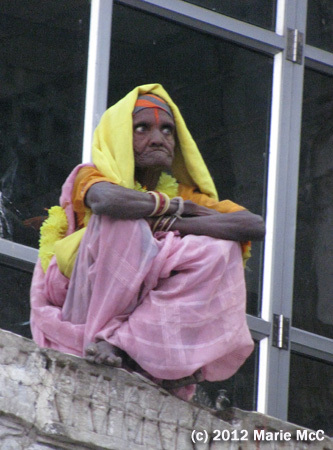 I gave the torn note to a beggar woman elsewhere in the temple who was not so picky. 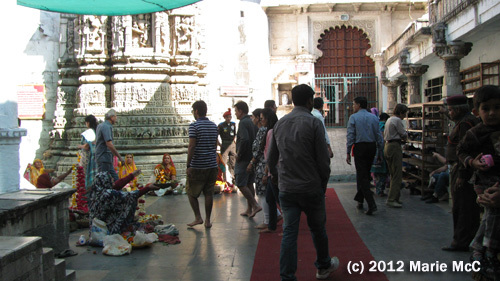 There were quite a lot of foreign visitors in line, waiting to go through the temple. In the center of the main hall were worshippers praying and doing rituals. Every once in a while, Pushker would turn to me and explain something about the temple or about the figures carved inside. Other tour guides were doing the same. The temple closes to visitors several times a day for prayers, but even though we were not there at a prayer time, it still didn’t seem right. I remember nothing remarkable about this temple. If pressed for a recommendation, I’d say it’s easily skipped if you have more interesting things to do. 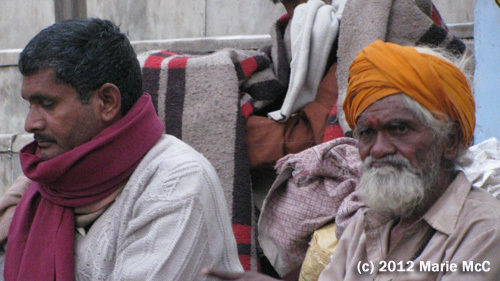 This entry was posted on February 25, 2013, in India, Travel, Udaipur. 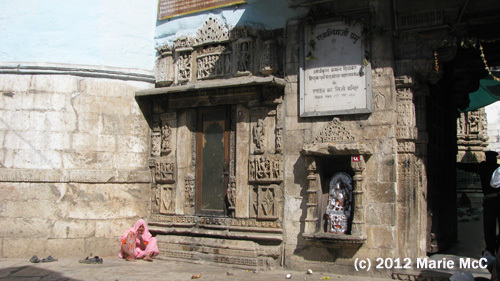 The Jagdish Temple in the heart of the old city, built in 1651, is dedicated to the Hindu Lord Vishnu. It is a landmark and a center of activity. 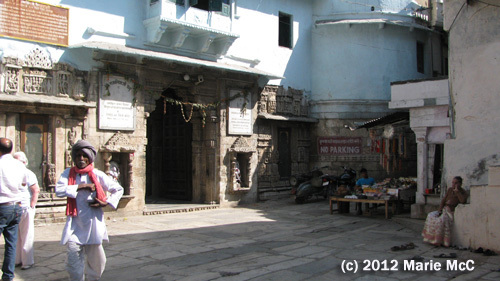 Many narrow, winding shop-lined streets with wandering tourists converge at the foot of the temple. This one leads to the City Palace. 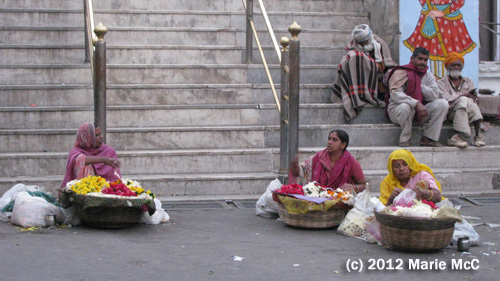 Flowers are always a part of Hindu prayer rituals, so there are always flower sellers at the base of the steps. In November the weather was pleasant during the day, but once the sun went down it was a bit chilly. There’s always a carnival like atmosphere near the temple, but so far I have only had time to observe it briefly in passing. 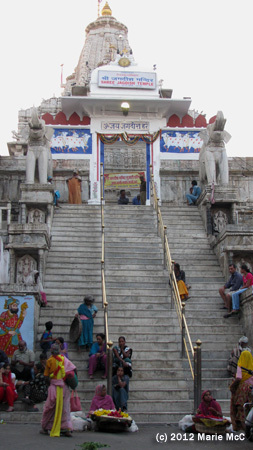 Two visits to Udaipur, and I still haven’t climbed the steps to visit the temple. It is a comforting presence, and I tell myself it will be there next time. I know I’ll be back again, not only because I love it here but because my friendships have given me a motivation to return. 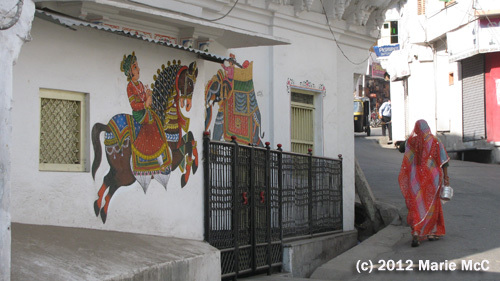 Although Udaipur has relatively few tourist attractions, especially for a city of its size (a little over half a million people as of 2011), the old city, with its charming maze of shop studded streets and its intensely romantic lake views, has an ambience I find irresistible. I intend to get to know it well. The temple will always be there. They say the third time is a charm. 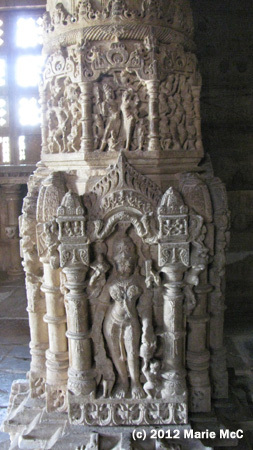 Maybe on my next visit to Udaipur I’ll finally have time to see it. 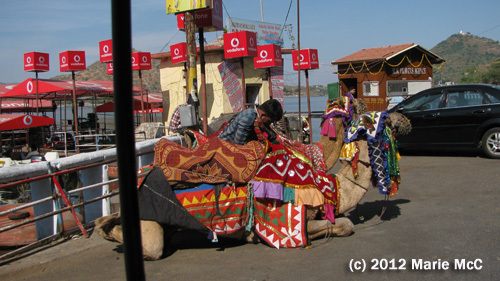 This entry was posted on February 21, 2013, in India, Travel, Udaipur. 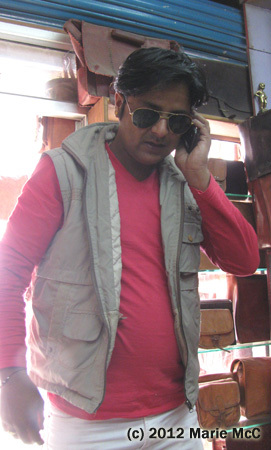 Pushker and I met Nirmal at his leather shop. I had mentioned that I needed a new pair of eyeglasses, so there was a discussion about where I should shop for them. Nirmal had to stay at the shop and do business for a bit, so Pushker and I walked down Bhattiyani Chohatta Road, where Nirmal’s shop was located, to an optician he recommended we check out. 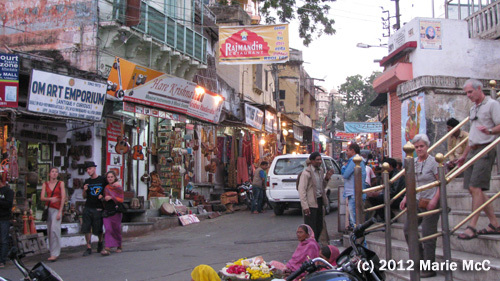 Nirmal’s leather shop is up the street and around the corner, right next to the tuk tuk. I had walked here many times last year when I stayed at a different hotel a few blocks from Nirmal’s shop on this very street. There is no way I would not have noticed all the murals on this street. Pushker said they had been here a long time, but “a long time” may be relative. They were clearly new and definitely not here when I was here a year and a half ago. Could you walk past this scene and not notice it? Neither could I. This neighborhood was ten times more interesting with all the new murals. We found the optician’s shop, and Pushker had a discussion with him about prices. 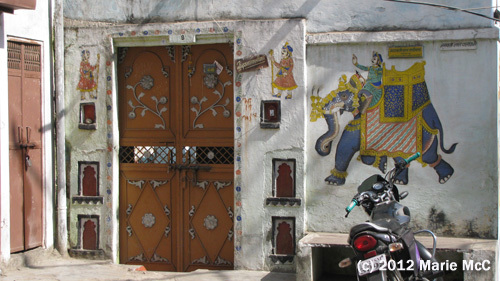 We headed back to Nirmal’s shop, where he was finally free. Pushker called Lokesh, a tuk tuk driver friend of his, to take us to the medical clinic for my eye exam. If there were tuk tuk driving contests, Lokesh would win. He squeezed us through spaces I never thought were possible! After a surprisingly short wait, I was shown in for my eye exam. 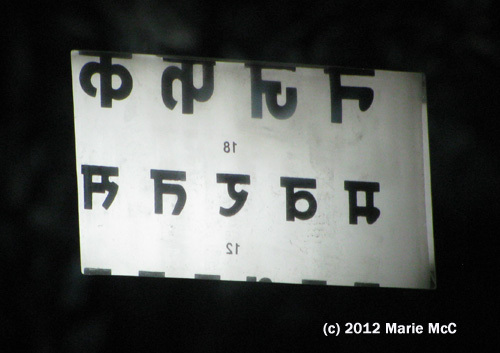 I had a little trouble reading the chart… But seriously, folks, they also had them in the Roman alphabet. After some comparison shopping, we finally found an optician who could make the glasses before my return flight to the U.S. and who Nirmal and Pushker felt was not price gouging me. I had new glasses and prescription sunglasses several days later at about half of what I would have spent in the U.S., and they were perfect!